It has been a while since I’ve posted and a lot has happened. In 2009 we attended and sold product at three different festivals. 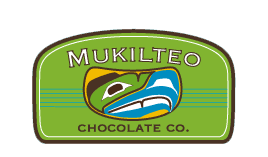 We also did the artwork for the logo for the Mukilteo Chocolate Company. At the same time I reworked my original crouching wolf design and finally got it to a point that I thought it was ready to be printed. I just got the first batch of prints today, hopefully they will do well. We also started working with a printer up in Victoria to do art cards. We now have 6×9 art cards available with all of my main designs. In Dec. 2009 I designed the first panel of a bentwood dish that Richard (my youngest brother) constructed and is painting. Now I just need to make time so that I can get the other three sides done. This month I have revamped parts of this website and have also put together my online store at Gear.medeek.com. I had originally set it up around Nov. 2009 using Magento (ecommerce shopping cart) however I was having serious performance problems with it so I took it down and have finally replaced it using Zencart. It seems to perform much better. Looking forward to some more festivals this summer.